When nomads settled down in cities at the beginning of civilization, it was a turning point for the way humans would live. A settled life meant agriculture, which meant excess grain, and that gave rise to trading and exchange and eventually seals and currency. Staying in one place in cities, it also implied construction and storage. This is where the use of mud came into existence, with the production of bricks and storage vessels. 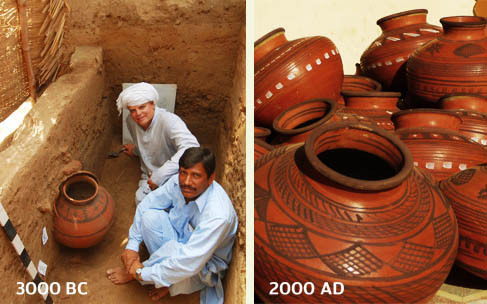 These evidences have been found in excavations at Harappa and Mohenjo Daro and many other ancient cities of Indus Valley Civilization, which existed about 5000 years ago. 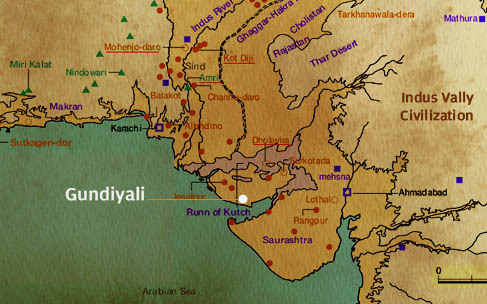 Thousands of years after the Indus Valley Civilization’s decline in around 1700B.C, the land has seen innumerable kingdoms, wars, industries and cultures, but history remains at a standstill at the excavations of those ancient cities, the origins of our modern lives. The gold and beaded jewelry, terracotta toys and bronze figurines, seals with symbols found at the sites reflect the objects we use till this day. One such object, unchanged through millennia is the earthen pot, a ubiquitous entity seen all over the country. 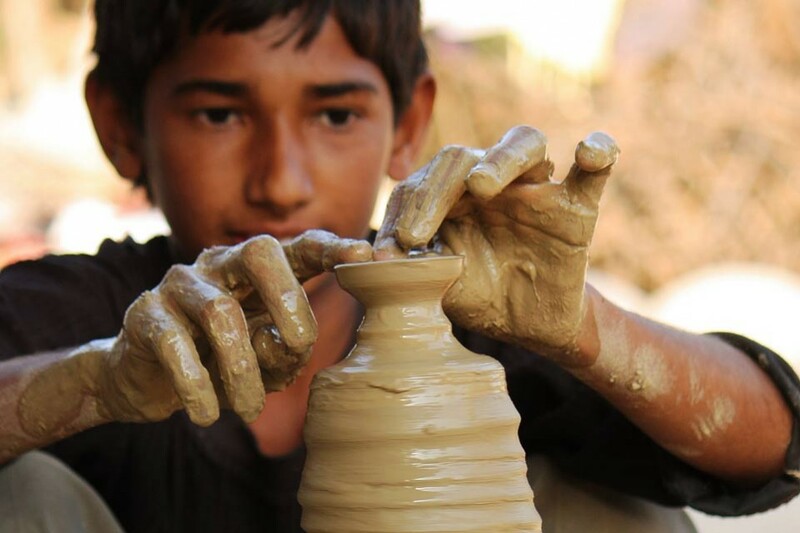 In the small village of Gundiyali (Mandvi Taluka, Bhuj, Gujarat, India), for generations, craftsmen have been making earthen pots (matka) with the same shapes and designs as those seen in Harappan excavations. 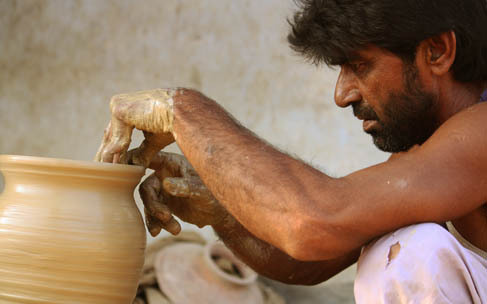 Gundiyali is essentially a potters’ village, with skilled craftsmen like Ali Mohammad whose forefathers migrated here from Sindh (Pakistan) a few hundred years back. 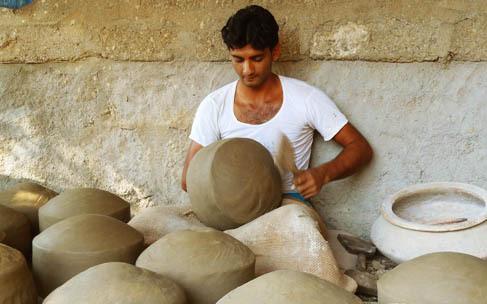 An earthen pot is a very simple design, but making it requires a set of skills and material, just as any other craft. The potters are so particular about the raw material, that they get mud from a specific 5 acre area, some 45 kmfrom the village. To make the mud finer, they grind and sieve it. Then they put the mud in water for 2-3 days and it becomes soft enough to be given any desired shape. This soft clay is shaped into a pot on a potter’s wheel and left to dry in shade. After a while, it is cleaned and put in the sun to dry and then baked in a furnace, powered by simple and locally available fuels of dry wood and cow dung. Once out of the furnace, the pots resemble ancient Painted Grey-ware pottery and the patterns that are painted on them also follow a similar aesthetic language. This human need for adornment and decoration is timeless. 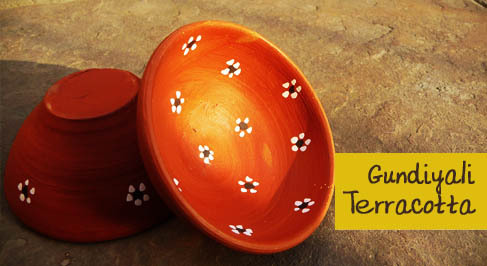 The pots of Gundiyali get their red colour from Geru, a type of soil (ocher/ umber), and the black and white dots and stripes are also made with natural material. 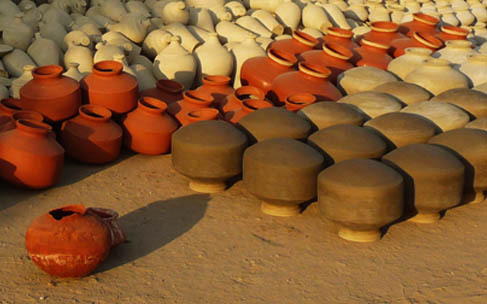 The terracotta pots of Gundiyali are distinct from the ones we may see elsewhere, because of their smooth finish which is a result of repeated cleaning at every stage of the process of their making. Apart from matkas, which sell the most in the summer, the potters also make diyas (earthen lamps) during Diwali, gullak (coin banks), cups, plates and glasses. The earthen pot is a living testimony of the constancy of good design. However evolved a civilization may become; a design that is good and optimum does not need any refinement. This simple product pleases all the senses with its beautiful rounded form, the smell of rain and the taste of cool water quenching a dry throat in the hot summer, it is one of the most beautiful inventions our ancestors have left us as a legacy.